I have been on quite a journey up to this point, having only started knitting socks in January this year. Encouraged by the purchase of sock yarn from John Arbon Textiles at Woolfest, back in March 2015 I signed up for a three week sock knitting course with Winwick Mum (Christine Perry) at Black Sheep Wools, near Warrington. It made sense that my second pair of socks used the lovely Alpaca Sock Yarn in charcoal (toes, heels and rib) and the moss colourway for the main body. 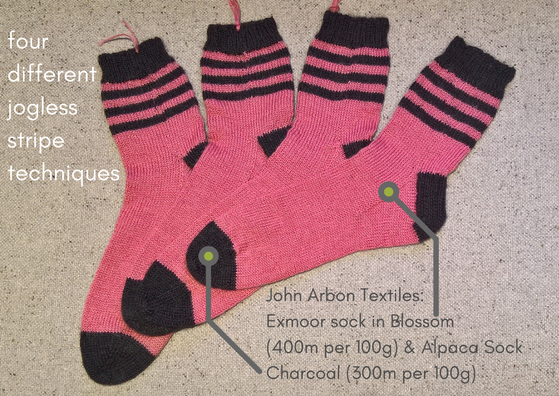 Lovely socks, great project, not enough moss green left to make a second pair (300m per 100g) as I was left with 44.9g. So then I started to wonder how many stripes I could add to the cuff of my sock to get two pairs out of 100g of Alpaca Sock Yarn? Luckily (!) I had just bought some of John Arbon's Exmoor Sock Yarn in Blossom (400m per 100g) which should allow me to make at least two pairs of socks because of the additional meterage and by using the same charcoal for the stripes I could accurately judge the weight of the stripes. Let the sock-off begin. I found that each stripe in the Alpaca Sock Yarn (charcoal colour) weighed just under 1g. Therefore, each sock would use an additional 3g which more importantly meant that in a pair of socks I could use just 49g of the main colour of Alpaca Sock Yarn. This is a great result because it means that using my standard sock pattern (60 stitches, 55 rows to heal, 55 rows for sole to toe decrease) I can get two pairs of socks from one skein of 300m per 100g of yarn. It is a bit yarn chickeny, but I like to live on the edge! What I hadn't expected to happen was the resulting, falling down the rabbit hole of creating the perfect jogless stripe. Sock one clearly shows that stripes in two colourway socks are rather handsome but some form of technique is required to make the stripes jogless. In sock one I had simply changed colours, aware that there would be some jogging but unaware how bad it would be. The first blog post that I came across was this one: http://techknitting.blogspot.co.uk/2007/01/jogless-stripes.html and so I attempted the 'Jogless Stripe How-To' on sock number two. Now this may work for some people (it certainly looked neat in the pictures within the blog) but it wasn't accurate enough for my knitting, so I continued searching. So, for sock three I used the Craftsy method and saw much better results. I used the elongated stitch in sock three and kept the marker in the same place. One of the things that this Craftsy Tutorial doesn't cover is whether or not to carry your yarn up. Given that this was sock three, I decided not to cut the yarn but carry it up to the next stripe (not a massive issue given that each stripe was only four rows deep). 1 - Knit one round in the new colour (you will need a place marker if you aren't already using one). Cut the old colour, leaving enough of a tail to sew in when finished. 2 - Remove your place marker and using the right hand needle, lift the stitch from the row below up onto the left needle. 3 - Knit the lifted stitch and the first stitch of the new round, together (K2tog). 4 - Add your place marker. This effectively means that next time you elongate a stitch, it won't be in line with the previous lifted stitch because you have moved the place marker over by one stitch. 5 - Knit as many rounds as required in your new colour. I tend to change colour every four rounds to make three contrasting stripes. 6 - When you have finished with the new colour stripes, you simply cut your yarn (leaving a tail) and start using the previous colour and repeat from Step 1 to 5 as many times as required. 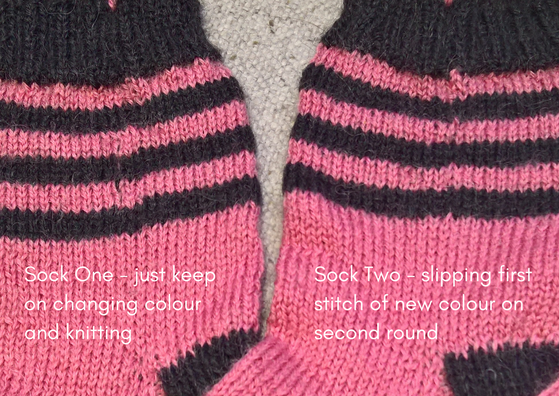 1 - Moving the elongated stitch over by one stitch within each stripe/colour change over. 2 - Cutting the yarn and not carrying it up inside the sock. I feel like I have achieved a very decent seamless sock stripe. There is more work involved in having to sew in all of the colour change-over ends but I think it is worth it because the loose ends allow you to manipulate the stitches and neaten the stripes up before you sew in the ends. As for the original question of whether or not I can knit two pairs of socks from John Arbon Alpaca Sock Yarn, the answer is now yes, and I just need to buy some more of it. Never a hardship!